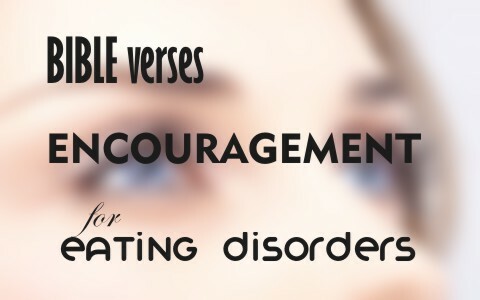 Here are 7 Bible verses that I hope will encourage those who struggle with eating disorders. I hope this gives help to all Christians who struggle with eating disorders in that you are not alone. Every Christian I know has their own personal struggle with something and even the spiritual giant, the Apostle Paul, struggled with his own flesh in his life (Rom 7). Perhaps reading Romans 7 will help you see that we all have our own struggles but God can provide a way of escape through prayer, His word, godly counsel, and accountability partners. If you see yourself in the way that God sees you, perhaps it will help you in your personal battle with your eating disorder. We are made in the image of God (Gen 1:26-27) with respect and dignity and remember that “the Lord sees not as man sees: man looks on the outward appearance, but the Lord looks on the heart” (1 Sam 16:7b). We all battle the tri-fold of temptation; the world, the devil, and the flesh and if we resist the Devil, He will flee from us. Satan would love nothing more than to trip up the Christian by tempting them to eat what they shouldn’t and more than they should but if we submit ourselves to God and resist the Devil and our flesh and the temptations the world hurls at us, we can avoid overeating to the point of harming ourselves. The human body is a marvelous thing. It performs wondrous things that we don’t even know about but once we are saved, our bodies become the temple of God for the Holy Spirit dwells in every believer and since this is true, we should all strive to glorify God in our bodies because our bodies do not really belong to us. We “were bought with a price” and that price was the shed blood of Jesus Christ. Oh how precious is this Bible verse. Try to see yourself as God sees you. He looks at the heart and He was pleased to make you just the way you are. If you’re eating disorder is due to your belief that you’re overweight, think about how God made you. Not one of us is exactly the same. Some are short, some are tall, some are thin and some are not. We all have different body chemistry’s too so we might not be entirely responsible for the way we look but to God, you are His child and your looks have nothing to do with how He sees you and how much he loves you. We can do all things to glorify God for that is the purpose for which we were created. If we don’t glorify God then we’re not living up to the reason He created us. Whatever we do, and that includes whatever we eat and drink, we should always think about doing it for the glory of God. The problem for me in being a “living sacrifice” is that I keep crawling off the altar. I need to make my life a living sacrifice that is “holy and acceptable to God” which is really our reasonable service to our Maker. He doesn’t expect perfection; He does expect obedience. No, it will never be perfect obedience but we should strive to present our lives and our bodies as a spiritual sacrifice that pleases God since that is a worthy goal. Paul wrote to the Corinthians “But he said to me, “My grace is sufficient for you, for my power is made perfect in weakness.” Therefore I will boast all the more gladly of my weaknesses, so that the power of Christ may rest upon me. For the sake of Christ, then, I am content with weaknesses, insults, hardships, persecutions, and calamities. For when I am weak, then I am strong” (2 Cor 12:9-10) and remember Paul’s admonition, “I can do all things through him who strengthens me” (Phil 4:13) which in reverse means you can do nothing without Christ’s strengthening you. This is basically what Jesus said in John 15:5, “apart from me you can do nothing.” You need to have an accountability partner, just as I do. I know we are stronger together than we are alone. I believe that every Timothy needs to be mentored by a Paul and I am no exception. What about you? Are you willing to be accountable to a trusted, close Christian friend? Are you willing to confess it when you fall? We need one another because as the Body of Christ, the church, the hand needs the eye and the foot needs the nose. We are not called to be “lone ranger” body parts but functioning together as one body and all for the glory of God, because nothing else matters but His glory. Previous post: What Is Replacement Theology or Supersessionism? Next post: How Can A Christian Have Peace That Transcends Understanding?